Grace Lutheran Church | there's no place like gnome. 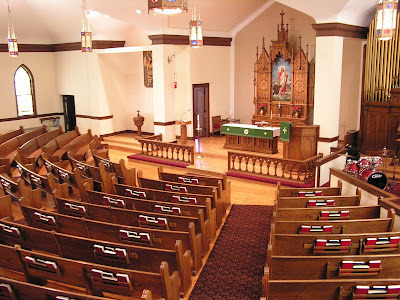 This is the sanctuary at Grace Lutheran Church, where I will be preaching, worshipping, and learning for the next year. It’s a beautiful place with stained glass windows and recently refinished hard wood floors. The other new feature in the sanctuary is the grand piano which was played for the first time only weeks ago. It sits just to the right of where this picture ends. On the left hand side is the baptismal font – above the font, there is a screen which is lowered for the contemporary worship service to display the words to songs/liturgy and announcements. Beginning September 27 (which also happens to be the first Sunday I will preach) the congregation will return to two services, whereas there was only one throughout the summer months. The 8:30 service will be traditional worship and the 10:45 is contemporary service. To end our short tour of Grace, to the right is a dreadfully narrow and steep spiral staircase which I will difficultly climb every Sunday while wearing a robe. Quite tricky. The staircase begins in a corner of the fellowship hall and leads to the sacristy, which is just off of the front of the sanctuary. It’s how the pastors and acolytes enter the service and thus I will become skilled at climbing spiral staircases while wearing a robe and heels. Now that’s a skill not every intern can put on their final evaluation. Nice, yellow shoes. I would like to know if you ever slide down the railing there. You would not trip down the stairs and it might be fun.